A Road Map for Learning: Improving Educational Outcomes in Foster Care A Road Map for Learning: Improving Educational Outcomes in Foster Care 2004 Nat. * Addressing the Educational Needs of Children in Foster Care- A Guide for Judges, Advocates and Child Welfare Professionals * Addressing the Educational Needs of Children in Foster Care- A Guide for Judges, Advocates and Child Welfare Professionals 2006 Nat. * Blueprint for Change Goals and Benchmarks (Insert Card) * Blueprint for Change Goals and Benchmarks (Insert Card) 2008 Nat. 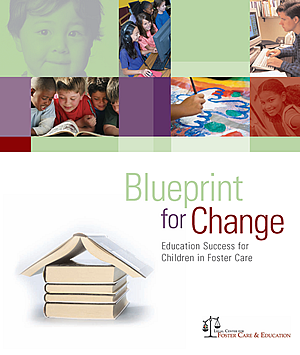 * Blueprint for Change: Education Success for Students in Foster Care * Blueprint for Change: Education Success for Students in Foster Care 2009 Nat. Caregivers, School Liaisons, and Agency Advocates Speak Out About the Educational Needs of Children and Youths in Foster Care Caregivers, School Liaisons, and Agency Advocates Speak Out About the Educational Needs of Children and Youths in Foster Care 2010 Nat. Center for the Future of Teaching and Learning: Ready to Succeed in the Classroom: Teachers' Ideas About How Communities Can Help Improve Educational Outcomes for Children and Youth in the Foster Care System Center for the Future of Teaching and Learning: Ready to Succeed in the Classroom: Teachers' Ideas About How Communities Can Help Improve Educational Outcomes for Children and Youth in the Foster Care System 2010 Nat. College Access and Success for Students Experiencing Homelessness - A Toolkit for Educators and Service Providers College Access and Success for Students Experiencing Homelessness - A Toolkit for Educators and Service Providers 2013 Nat. Educational Advocacy Curriculum Educational Advocacy Curriculum Nat. Educational and Employment Achievements of American Indian/Alaska Native Alumni of Foster Care Educational and Employment Achievements of American Indian/Alaska Native Alumni of Foster Care 2009 Nat. * Everyone Can Make a Difference Volume 2 (Bright Spots) * Everyone Can Make a Difference Volume 2 (Bright Spots) 2011 Nat. Frequent Moving has a Negative Affect on the School Achievement of Foster Children Makes the Case for Reform Frequent Moving has a Negative Affect on the School Achievement of Foster Children Makes the Case for Reform 2010 Nat. Getting Out of the Red Zone Getting Out of the Red Zone 2003 Nat. Grappling with the Gaps - Toward a Research Agenda to Meet the Educational Needs of Children and Youth in Foster Care Grappling with the Gaps - Toward a Research Agenda to Meet the Educational Needs of Children and Youth in Foster Care 2010 Nat. Group Schools Hill Staffers on Foster Youths’ Educational Struggles Group Schools Hill Staffers on Foster Youths’ Educational Struggles 2014 Nat. How States Are Implementing the Education Provisions of Fostering Connections How States Are Implementing the Education Provisions of Fostering Connections 2009 Nat. * How the IDEA and Fostering Connections Overlap * How the IDEA and Fostering Connections Overlap 2012 Nat. IDEA 2004: Nuts & Bolts of Homeless and Foster Care/Ward of the State Provisions IDEA 2004: Nuts & Bolts of Homeless and Foster Care/Ward of the State Provisions 2004 Nat. IDEA Regulations IDEA Regulations 2004 Nat. * In School, the Right School, Finish School: A Guide to Improving Educational Opportunities for Court-Involved Youth * In School, the Right School, Finish School: A Guide to Improving Educational Opportunities for Court-Involved Youth 2007 Nat. * Issue Brief: Infants and Toddlers with Disabilities in the Child Welfare System * Issue Brief: Infants and Toddlers with Disabilities in the Child Welfare System 2012 Nat. Issue Brief: Identifying Special Education Decision Makers for Children in Foster Care: State Law Questions Issue Brief: Identifying Special Education Decision Makers for Children in Foster Care: State Law Questions 2007 Nat. * Issue Brief: Making Best Interest Decisions under Fostering Connections * Issue Brief: Making Best Interest Decisions under Fostering Connections 2011 Nat. * Legal Center for Foster Care & Education - Publications and Resources * Legal Center for Foster Care & Education - Publications and Resources 2011 Nat. * Legal Center for Foster Care & Education - Technical Assistance * Legal Center for Foster Care & Education - Technical Assistance 2011 Nat. Letter from US Department of Education Office of Special Education and Rehabilitative Services to State Director of Special Education Letter from US Department of Education Office of Special Education and Rehabilitative Services to State Director of Special Education 2013 Nat. * Mythbusting: Breaking Down Confidentiality and Decision-Making Barriers to Meet the Education Needs of Children in Foster Care * Mythbusting: Breaking Down Confidentiality and Decision-Making Barriers to Meet the Education Needs of Children in Foster Care 2005 Nat. National Education Datasheet 2018 National Education Datasheet 2018 2018 Nat. NATIONAL SAMPLE JUDICIAL BENCHCARD NATIONAL SAMPLE JUDICIAL BENCHCARD 2017 Nat. * November 2011 Federal Foster Care and Education Convening Summary * November 2011 Federal Foster Care and Education Convening Summary 2012 Nat. Post-Secondary Education and Training Support Utilization by Students from Foster Care: Findings from Scholarship Recipient Interviews Post-Secondary Education and Training Support Utilization by Students from Foster Care: Findings from Scholarship Recipient Interviews 2008 Nat. * Q & A - Federal Laws That Increase Educational Opportunities for Older Youth in Out-Of-Home Care * Q & A - Federal Laws That Increase Educational Opportunities for Older Youth in Out-Of-Home Care 2009 Nat. * Q & A Blueprint For Change: Education Success For Children in Foster Care * Q & A Blueprint For Change: Education Success For Children in Foster Care 2009 Nat. * Q & A: How Can We Ensure Educational Success for Dependent Youth in Congregate Care * Q & A: How Can We Ensure Educational Success for Dependent Youth in Congregate Care 2014 Nat. * Q & A: Courtroom Education Advocacy * Q & A: Courtroom Education Advocacy 2009 Nat. * Q & A: Child and Family Service Reviews and the Education Well-Being Outcome * Q & A: Child and Family Service Reviews and the Education Well-Being Outcome 2009 Nat. * Q & A: No Child Left Behind and Children in Out-of-Home Care * Q & A: No Child Left Behind and Children in Out-of-Home Care 2008 Nat. * Q & A: Surrogate Parent Programs * Q & A: Surrogate Parent Programs 2009 Nat. Q & A: Surrogate Parent Programs Q & A: Surrogate Parent Programs 2008 Nat. Ready to Succeed in the Classroom Ready to Succeed in the Classroom 2010 Nat. * Special Education Decisions (Factsheet for Caseworkers) * Special Education Decisions (Factsheet for Caseworkers) 2008 Nat. Special Education Decisions (Factsheet for Children's Attorney) Special Education Decisions (Factsheet for Children's Attorney) 2008 Nat. Special Education Decisions (Factsheet for Foster Parent) Special Education Decisions (Factsheet for Foster Parent) 2008 Nat. Special Education Decisions (Factsheet for Youth) Special Education Decisions (Factsheet for Youth) 2008 Nat. * Special Education Decisions for Children in Foster Care: Everyone Has a Role * Special Education Decisions for Children in Foster Care: Everyone Has a Role 2007 Nat. Supporting Success - Improving Higher Education Outcomes for Students from Foster Care Supporting Success - Improving Higher Education Outcomes for Students from Foster Care 2008 Nat. Sustained and Coordinated Efforts Could Facilitate Data Sharing While Protecting Privacy, US GAO Report Sustained and Coordinated Efforts Could Facilitate Data Sharing While Protecting Privacy, US GAO Report 2013 Nat. The Association Between Length of Stay in Residential Care and Educational Achievement: Results from 5- and 16-year follow-up studies The Association Between Length of Stay in Residential Care and Educational Achievement: Results from 5- and 16-year follow-up studies 2010 Nat. The CFSR: State Results around Educating Children in Foster Care The CFSR: State Results around Educating Children in Foster Care 2003 Nat. The Need for Educational Stability for Children in Foster Care: Recommendations for the Elementary and Secondary Education Act Reauthorization The Need for Educational Stability for Children in Foster Care: Recommendations for the Elementary and Secondary Education Act Reauthorization 2010 Nat. Time for Reform: Aging Out and On Their Own Time for Reform: Aging Out and On Their Own 2007 Nat. Underperforming Schools and the Education of Vulnerable Children Underperforming Schools and the Education of Vulnerable Children 2009 Nat.